These serving plates are stunning. The colors are vibrant. They will get a great deal of attention. 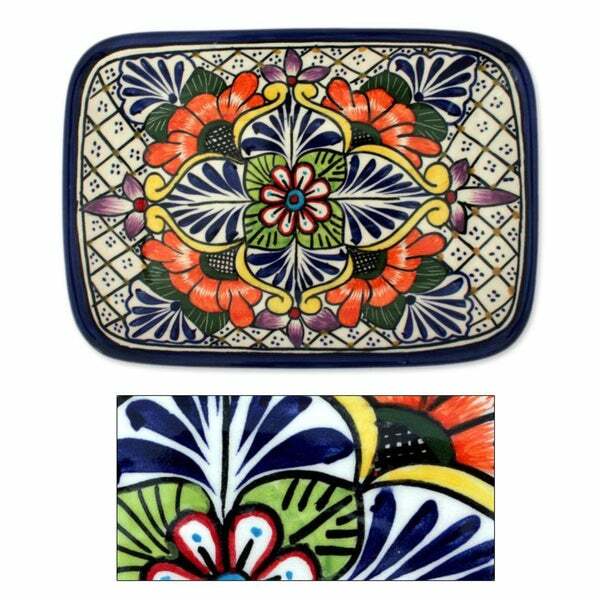 Flowers blossom with regal elegance in the unique design of this hand crafted Talavera plate. Mexico's Pedro Alba enjoys fusing the legendary Talavera ceramic techniques with his novel designs for this handcrafted serving plate. i like it but it is a SMALL plate and should not be advertised as a serving plate. It is for decor purposes. It fits a sandwich. This serving plate is very nice quality, the hand painting is quite nice. The plate is a little smaller than I expected, but pretty all the same. This beautiful plate was part of a wedding present. Daughter-in-law thrilled with the different plates and gorgeous colors and patterns. Love the design and very useful. Beautiful pieces... are used it for my daughter‘s 15th birthday. For her candy table. Everyone loved them super excited to have bought them. Personally a little bit on the smaller side. Beautiful and again, would like to see more! I think it is pretty and may use it for a gift.